Coils are wrapped with VCI / HDPE and packed with galvanised iron sheets on OD (outer diameter) and side of the coils with high tensile steel strapping and metallic seal. Eye to sky coils kept on wooden skid. 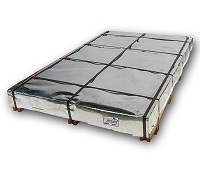 Sheets are stacked on wooden crate wrapped with VCI / HDPE material and packed with galvanised iron sheets and tightened with high tensile steel strap and metallic seal. Edges of sheets are protected with edge protector. Identification tags are placed on packed bundle. 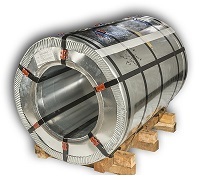 Export Packing: Steel coil in vertical form (eye to sky), horizontal coil form (eye horizontal) and sheet form are sent in containers as cargo from the plant (please see below). These containers are loaded, lashed and choked in the plant basis the recommendations of the Shipping Line, under the guidance and strict supervision of our personnel. 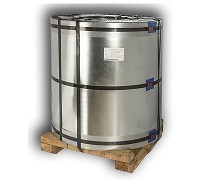 In accordance with Quarantine Laws, wood, such as dunnage and crates are fumigated under the ISPM – 15 Standards with Methyl Bromide and/or is Heat Treated before being used. Special care is exercised to ensure that the entire weight of the cargo is equally distributed on the floor of the container. This is then lashed and choked properly to withstand both road and sea transportation. NSAIL ensures that the material should reach to the customer in the same way it leaves the factory. 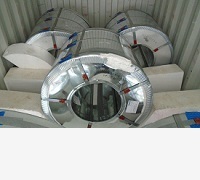 In addition to above, NSAIL also incorporated the latest eco-friendly development in containerised shipment with specially designed EPS (Expanded Polystyrene) to avoid handling and transportation damages inside the container, as compared to the conventional system of wooden crate lashing and choking.